Last year’s Concert in the park was a huge success pulled together by the event’s creator, co-coordinator, and Park Santiago resident Casey DePersis. The concert was a fun way to spend a summer afternoon and evening. It is also produced to benefit Grandma’s House of Hope a local charity. The 2010 concert was the Park Santiago Neighborhood Association’s gift to the community to help foster community spirit, provide opportunity for residents and service organizations to display their arts, crafts, and services. This year’s Concert in the Park on August 27th promises to be bigger and better! The 2011 event was made financially possible through the generosity of business owners who either live in Park Santiago, or have local businesses that serve Park Santiago. It is their gift for all Park Santiago residents to enjoy. They are folks with passion and dedication to Park Santiago. Here we wish to profile our largest sponsor, Memphis at the Santora and acknowledge all the other wonderful sponsors. Memphis is our Rock Star-of-a-sponsor! They provided the largest donation covering nearly a quarter of the entire concert budget. Memphis will also add a new dimension to the event by providing non-snack food. They will be selling their famous barbequed pulled pork sandwiches, grilling tasty soul burghers, all-beef Chicago brand hot dogs, and drinks. Their Memphis Café Original BBQ sauce is also available for purchase so you can get that great Smokey Southern favor at you next BBQ. So please come to the Concert with a healthy appetite! 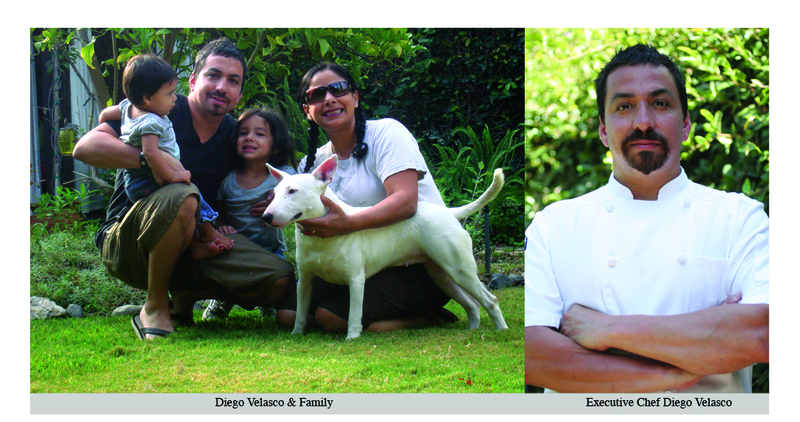 Executive chef, Memphis Group partner, Diego Velasco, his wife Arie, are Park Santiago Residents. While living in Costa Mesa, the Velascos’ discovered the neighborhood in 2001 when Diego was in process of opening Memphis at the Santora. They immediately knew this was the place where they wished to live. However, a small home in Washington Square became their first Santa Ana abode. With the pending birth of their first daughter, Memphis in 2004, and need for a larger home, a Larchmont house came on the market just in time. Diego says besides the physical beauty of the neighborhood and adjacent park, what he and Arie like best is the incredibly eclectic, mix of talented, artistic, creative people whom they have befriended here. Such a friendships with Catherine Graziano and Joe Ongie, former owners of the Gypsy Den lead them to their present home on Valencia Avenue (coincidently upon the birth of their second child, Sofia.) If you attended this year’s 4th of July Parade the Velasco children, along with those of very close friends and neighbors dawned powdered wigs as founding fathers in their Signing of the Declaration of Independence float. As executive chef, Diego is revamping the lunch and dinner menus and plans to roll out new dishes this Fall. He also participates in the Old Towne Orange Farmers and Artisans Market by giving cooking demonstrations with all locally produced food. Many of the seasonal items for the Old Towne Market are incorporated into the restaurants dishes. Please be sure to visit Memphis at the Santora in the Artist’s Village downtown and enjoy cocktails, delectable food, and thank Diego for his patronage of our concert event. For more information on Memphis, the Memphis logo on the webpage is a direct link to their restaurant web site. Very significant contributions by our “Hipster Producers” included local Real Estate experts Judy Evans of Century 21 Real Estate and Nicole Doughty of Santa Ana Realty. A donation of this level was also given by a neighbor/business owner who wished to remain anonymous. Many thanks go out to the third level sponsors the “Groovy Groupies”: Brown Colonial Mortuary, The Santa Ana Rotary Club, Guarantee Chevrolet, and Mother’s Market. Very special thanks to OC Printing, owner and long time Park Santiago resident Marcos Cortez for providing all the printing needs of the event and the Association, the First Congregation Church, and especially Casey DePersis for spending countless hours in dedication to producing this great event.